Gluteus medius is a broad, thick, radiating muscle found on the upper, lateral part of the buttock, just below the iliac crest – if you place your hands on your hips, that’s the large bony area that your fingers rest on. It is a fan-shaped muscle, wide at the top, narrow at the bottom and is found underneath the gluteus maximus muscle. Glute med arises from the gluteal surface of the ileum (part of the pelvis) between the anterior and posterior gluteal lines, an extensive area from the iliac crest above almost as far as the sciatic notch below, attaching via a strong layer of fascia of which it shares the posterior part with gluteus maximus. Three sets of fibres spread out, the anterior fibres passing downwards and backwards, the middle fibres passing straight downwards and the posterior fibres downwards and forwards before coming together to form a flattened tendon which attaches to the superolateral side of the greater trochanter on the femur. Gluteus medius is a strong hip abductor, taking the thigh outwards away from the body. The anterior fibres contract to produce internal rotation (twisting the leg inwards) whereas the posterior fibres aid lateral rotation (twisting outwards). 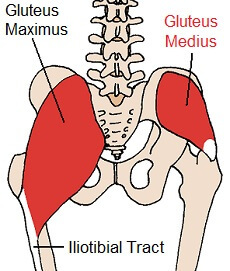 Gluteus medius plays a vital role in the stability of the pelvis during walking and running. When walking, approximately 60% of the time we are standing on one leg, known as the stance phase of the gait cycle. When standing on one leg, there is a tendency for the opposite side of the pelvis to drop due to the loss of support. Gluteus medius works hard on the supporting side to maintain a level pelvis so that the leg can be brought forwards for the next step. 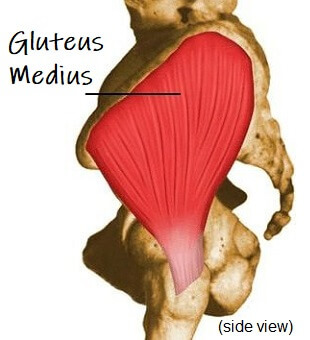 Weakness in the gluteus medius muscle results in the pelvis dropping on the opposite side as you walk or run. It also helps to control hip and pelvic rotation during walking and running. If gluteus medius is weak or isn’t functioning properly, people walk with what is called a Trendelenburg gait, where the opposite side of the pelvis drops with each step due to the last of support. Weakness in the left glute med muscle causes the right side of the pelvis to drop when swinging the right leg forwards when walking. This can make walking awkward and people tend to compensate by swinging their trunk towards the weakened side to keep their pelvis level and their centre of gravity over the standing leg so they can swing their leg through. Running is almost impossible.